This will be the last of this series of photos from my weekend in Paris in late April. 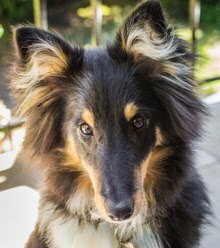 I was able to stretch three days worth of photos into two months' worth of blog posts. So... when I left the restaurant where I had eaten lunch, I walked over to the Orsay museum to meet my friends. It was spitting rain, so I didn't take the camera out of my backpack, so, no photos. 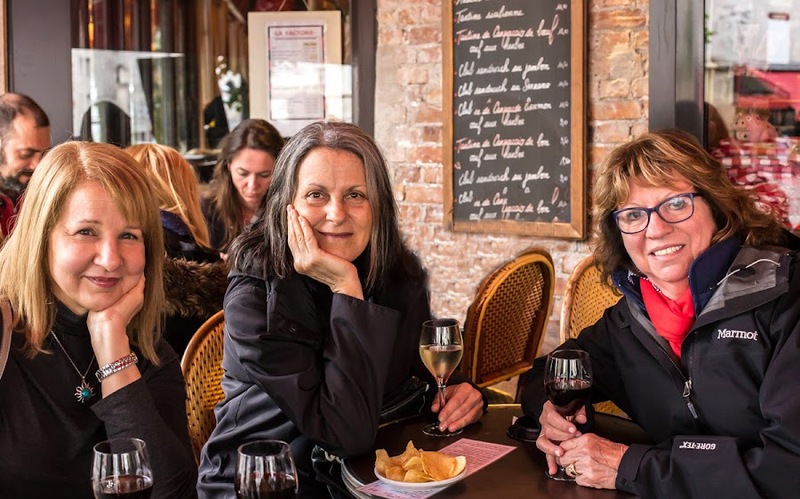 Having a glass of wine with my friends L, J, and P, at a café near the Père Lachaise cemetery. Those potato chips really hit the spot! I got to the museum early, and the rain was becoming more steady, so I decided to duck into a café for drink. I saw a place on the corner of the rue de Lille and the rue de Bellechasse, just across from the museum's main entrance. The line to get into the museum snaked back and forth, filling up the plaza in front and stretched around the corner and down the rue de Lille. And it was getting longer, and it was raining. I'm glad I wasn't waiting in line. My friend L wanted a copy of this photo, and asked if I could remove the woman between J and P, so I gave it a shot. It's not perfect, but it's not bad, either. The café/brasserie was called Les Deux Musées and it was stuffed full of people finishing lunch. They weren't letting anyone sit down who wasn't going to order lunch, the outside tables were wet with rain, and there was a line out the door. Still, there was room at the bar for drinkers and I went in. French bars are not like American bars. There are no stools, so bar patrons stand. I ordered a glass of white wine and watched all the activity. The bartender was busy making drinks and coffee for the diners and loading and unloading glasses into and out of the little dishwasher under the bar. I had a second glass of wine (I was that early) and was really enjoying watching all the hustle and bustle around me. People came and went, and the rain continued. When I finished, I went out and found my friends, or they found me, and off we went on another adventure. We took the subway over to the Père Lachaise cemetery to see the graves of famous people like Colette, Jim Morrison, Edith Piaf, and Honoré de Balzac, to name a few. After our walk, we ducked into a nearby café for a drink. Toward the end of the day we took a short walk through the Parc Monceau before heading back to our respective hotels to get ready for dinner. We had reservations at eight at a Left Bank restaurant I've known for many years, Le Petit Prince de Paris. Dinner was great fun and I said good-bye to my friends who would be leaving early Monday morning for their tour of Normandy. Monday turned out to be cold, wet, and windy, and I tried to go for a walk but it was no fun at all in that weather. I took refuge inside a department store for a while, then got the idea to have lunch in a Thai restaurant I knew of. I think it's the same place that a bunch of us (including Ken) ate in back in 1982. It had been updated since then. Lunch was delicious and a real treat for me since we don't have many Thai restaurants out here in the countryside. When I was through, I went back to the hotel to check out, then went back across town to get my late afternoon train home. 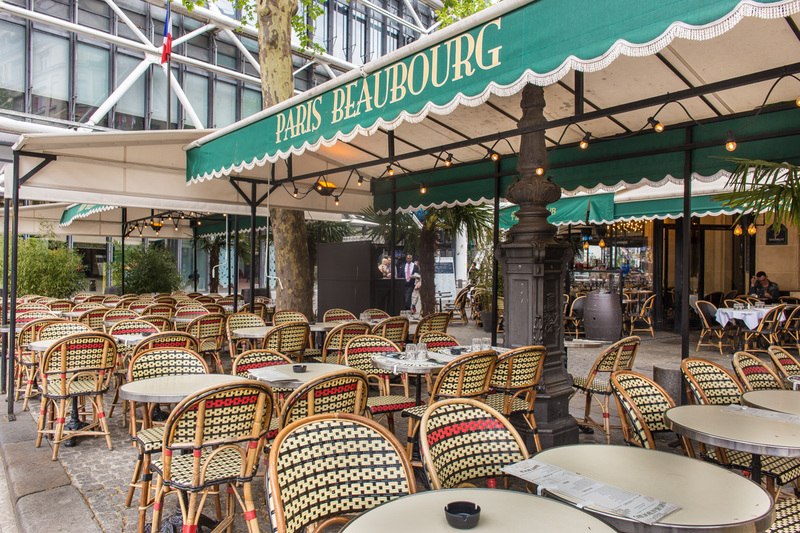 Ken and I found two good brasseries one year (sometime in the '90s) while staying in this neighborhood not far from the Eiffel Tower. This one is called le Recrutement and was, at the time, kind of a sports bar/café. While eating there one year, Ken recognized a member of France's parliament walking by, stopping to say hello to friends or colleagues. She was Michèle Alliot-Marie and would later become Minister of Defense under Chirac and Secretary of State under Sarkozy. This is where I ate lunch on a rainy Sunday afternoon in April. The other place, called le Centenaire, is diagonally across the street. The first time we ate there I had one of the most memorable meals of my life: a simple roasted chicken with French fries. It was the best roasted chicken I had ever tasted, at least up to that point in time. Back to last April. As I headed toward the restaurant, it started to rain. It pretty much rained during my whole lunch, but I was indoors so I didn't mind. Le Recrutement has been taken over by new management with a much younger staff and a new open kitchen. They had a chicken Caesar salad on the menu (admittedly not a very French dish) and it sounded good, so that's what I ordered, along with a small carafe of red wine. I was not disappointed. After a coffee, I headed toward the Orsay museum where I was to meet up with my friends, but not before turning and snapping this photo. Last Saturday I posted a photo of the place de la Concorde as seen looking down the rue Royale. Here's another shot from edge of the place itself. I walked around the western edge of the place, past the Hôtel de Crillon (a fancy-schmancy high-end hotel) and the American Embassy (lots of guards with guns), across the avenue des Champs-Elysées, and to the river. 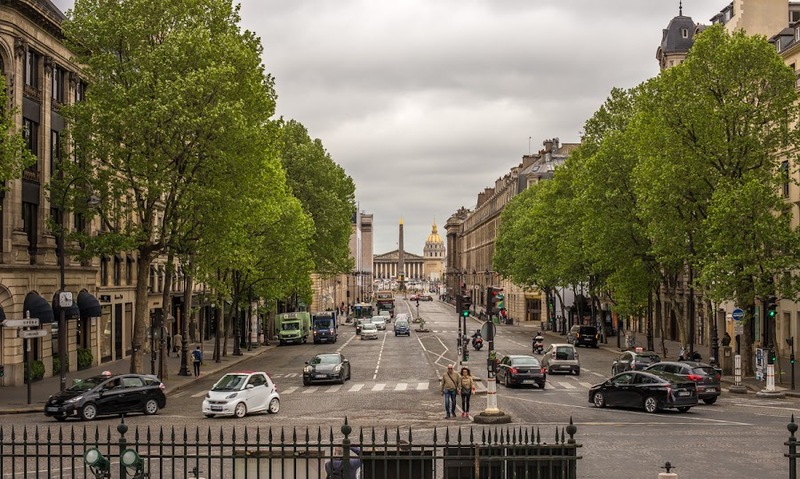 The place de la Concorde sits between the Tuileries garden and the avenue des Champs-Elysées. I was forming an idea for lunch. 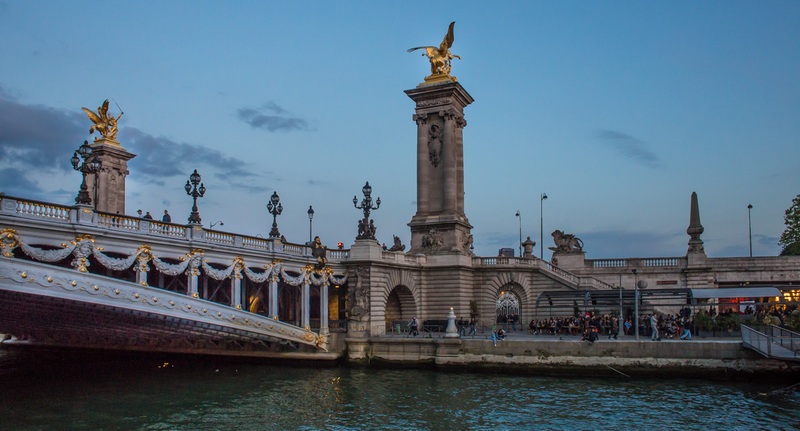 I know of two brasseries/cafés over in the 7th arrondissement on the boulevard de la Tour-Maubourg, so I headed downstream along the river and crossed the pont Alexandre III toward the esplanade des Invalides. The thought of a good lunch spurred me on. Directly up the boulevard Malesherbes from the Madeleine church is the imposing church of Saint-Augustin. Built in the late 19th century, the church blends elements of the romanesque and byzantian styles. It's not a church I know, except as a landmark. 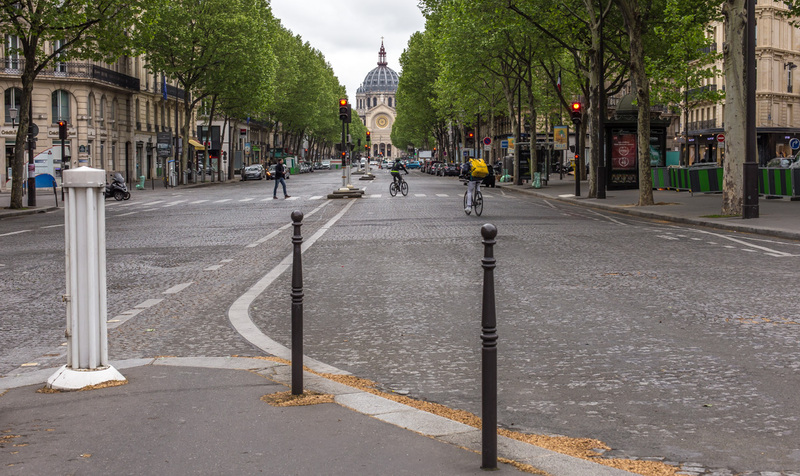 Standing near the southwest corner of the Madeleine church looking up the boulevard Malesherbes. It turns out that my hotel was not far from the church, but I was more focused toward the other direction during my Parisian weekend back in April. 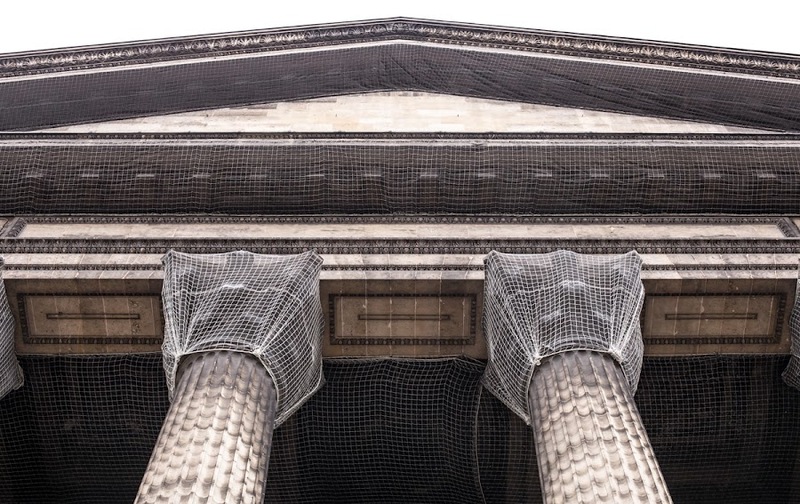 That's what could fall on your head if this part of the Madeleine church was not covered in netting. Time and pollution take their toll on stone buildings and they can begin to crumble. Renovation is necessary, but it's time-consuming and expensive. In the meantime, some temporary protection is warranted. This is the netting that's intended to catch any falling pieces of stone. The view above is part of the back (north) façade of the Madeleine church. It's quite plain. The gates that surround the building were closed here, so my only access was by way of the colonnade on the podium level or through a small gate on the eastern side at street level. I read that restoration is under way and that the city is putting up a good sum, but they continue looking for donations and other private funds to complete the work. 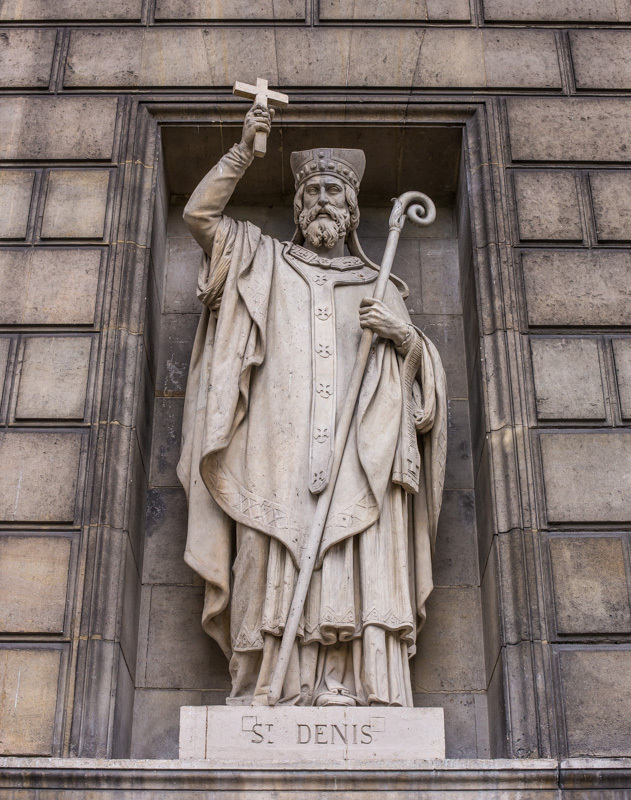 Saint Denis (Dionysius in Latin) was the first bishop of Paris in the 3rd century. Some of the statues that adorn the eastern and western façades also need some work. I took this photo of Saint Denis for no particular reason, except as an example of the statues in their niches. It's also much cleaner than the others, so I assume its restoration was part of the first phase of exterior work. The floor of the Madeleine church is high above street level. The building sits on a podium, its roof supported by a Corinthian colonnade that runs around all four sides. I took these photos on the western side of the church, looking both southward and northward. Looking south toward the front of the building and the rue Royale. The building's architectural style is, as I've mentioned, neoclassical. But it's more than that. The building is a 19th century replica of the classic greco-roman temple. The podium, the rectangular plan, the columns, the front portico, and the triangular pediment are all elements of the Roman temple style. Looking north toward the back of the building along the western colonnade. Examples of this building type survive antiquity. One of the more well-known of them in France is the Maison Carrée in the southern city of Nimes, built in the second century AD. Perhaps the most famous of the ancient temples is the Parthenon in Athens, Greece, completed over 400 years earlier. 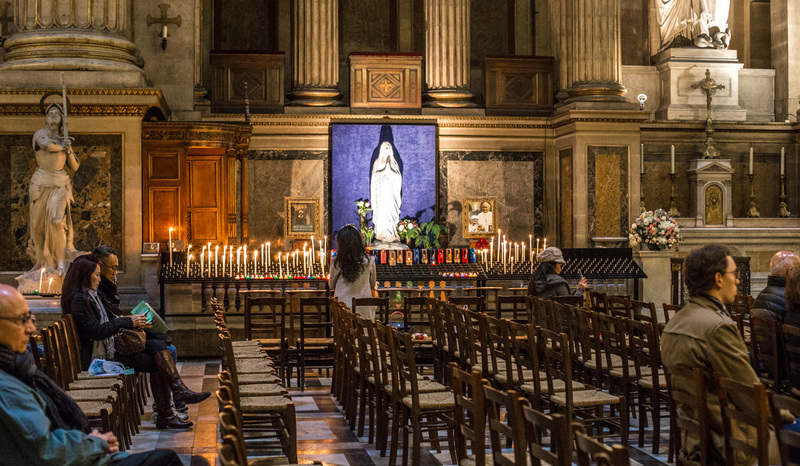 I certainly wasn't the only tourist to enter the church of la Madeleine on that Sunday morning. I was surprised to find a service going on inside. I'm not Catholic, but it didn't seem like a mass to me. Just a priest (I assume) standing at a lectern off to the side of the main altar. And he was speaking in French, not Latin, with many references to Jesus, of course. The sound wasn't great and I didn't really focus on what he was saying. Maybe it was just a general, non-denominational service. Do they do that kind of thing? You can see the priest under the angel statue on the right side of the altar. I was also not the only tourist taking photos while the service was going on. I hope I was among the more discreet. 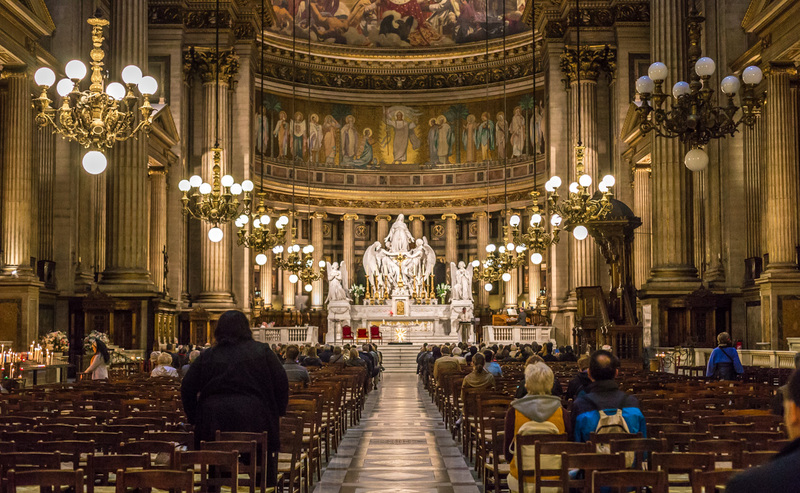 The interior is vast, but the Madeleine is not a cathedral, nor is it a soaring gothic construction. It's just a church, but it's a big one. The building's neoclassical architecture is on full display inside, notably in the corinthian and ionic columns, the ornate entablatures, and the triangular pediments. A woman lit a candle and, I assume, said a prayer. I imagine that's a statue of Mary, the church's namesake, in front of the purple screen. I finished my snapshots quickly and went back outside. I decided to walk around the terraces of the church and see what the exterior looked like up close. 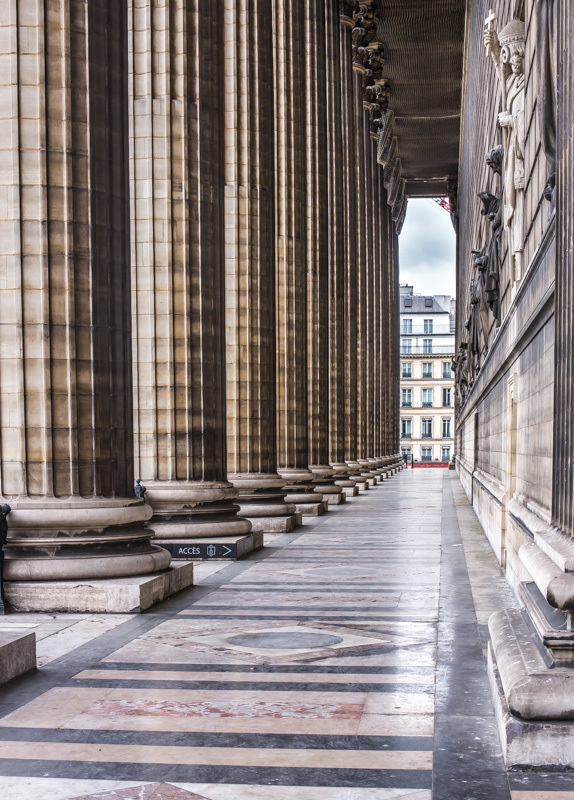 I found myself in the Place de la Madeleine, in front of the Madeleine church, a massive neoclassical construction from the early 19th century. 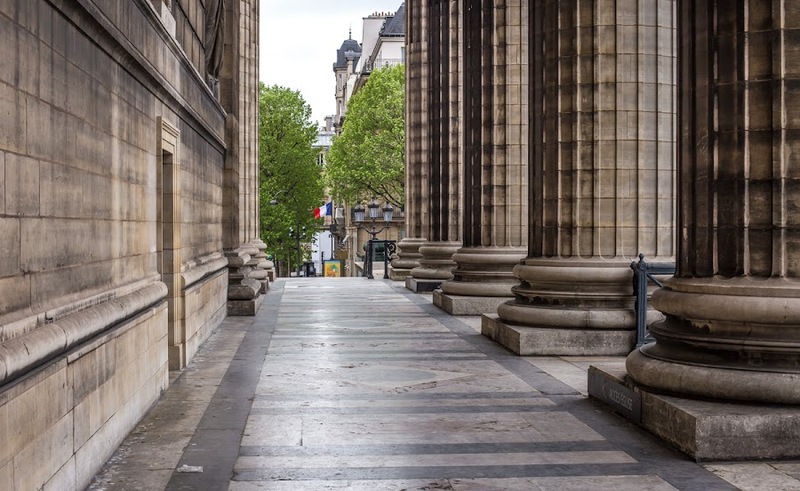 From the front steps, the view is down the rue Royale toward Concorde, across the Seine, and to the equally classically styled National Assembly building. The Egyptian obelisk stands in the center of the Place de la Concorde, where King Louis XVI and Marie Antoinette lost their heads. The building with the columns is the National Assembly, and the gilded dome is the church at Invalides, under which Napoléon is buried. I climbed the steps for a better view, snapped a few photos, then decided, what the heck, to go inside and have a look. I don't remember being inside the church before. 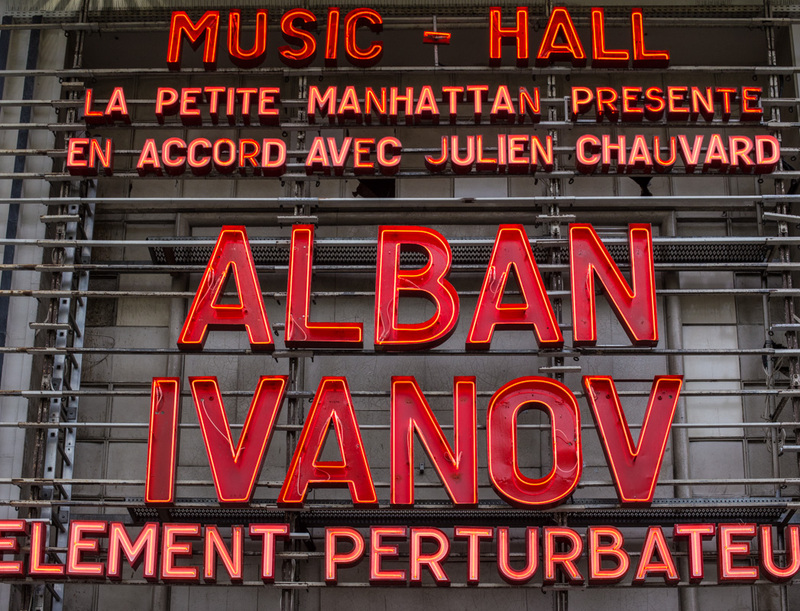 This is the marquee outside the Olympia, probably the most famous and prestigious of Parisian music halls. The Beatles sang here. So did Simon and Garfunkel and the Rolling Stones, to name a few of the English-language acts. Countless French, Canadian, and Belgian stars have also performed at the Olympia. Ken and I have been several times over the years to see stars like Véronique Sanson, Serge Lama, Rock Voisine, and France Gall. The classic red neon lettering on the marquee above the entrance to the Olympia music hall. Most of the greats of French music have played the Olympia. Edith Piaf, Jacques Brel, Yves Montand, Johnny Halliday, and Céline Dion, just to name a few you might recognize. Stand-up comics also appear here, as evidenced by today's photo. I've not heard of this guy, but he's apparently a comic and was the headliner at the Olympia when I walked by in April. I was on the boulevard des Capucines, making my way from Opéra to Madeleine, when I passed the rue Edouard VII. 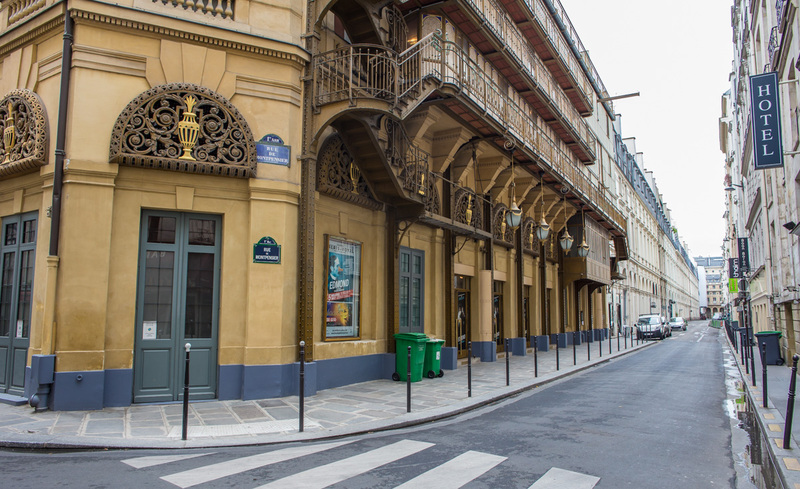 The street leads to an enclosed square of the same name and the Edouard VII Theater. Although I didn't go into the square, I snapped this photo from the boulevard. 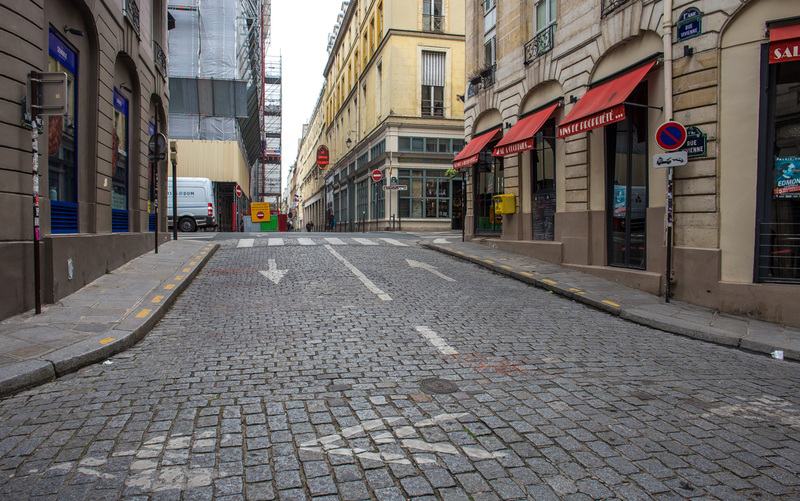 The rue Edouard VII leading into the square looked particularly neat and tidy. The theater opened in 1913. Apparently it started out as a movie theater, but by 1916 it had been transformed into a traditional stage for live performances. 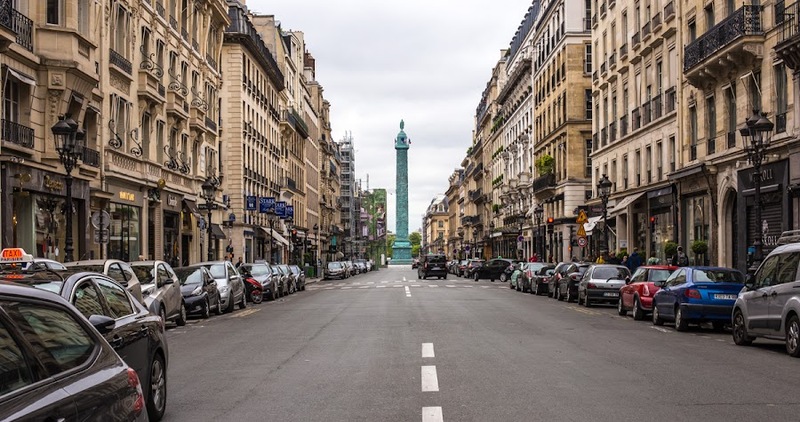 Here's a view from the Place de l'Opéra, looking down the rue de la Paix toward the Place Vendôme and the monument at its center, the Vendôme column. The column was made to commemorate Napoléon's victory in the Battle of Austerlitz (1805). The rue de la Paix was quite peaceful on this Sunday morning. A statue of Napoléon is perched at the top of the column. The column was fabricated from the melted cannons captured during the battle. It's been restored a couple of times, apparently. The place where it sits is the center of Paris' diamond and precious jewel trade. Very swank, very high-end. It's also the home of the famed hotel, Le Ritz. My walk took me through the Place de l'Opéra and by the opera house for which it's named. There are two operas in Paris. This one is the original, designed by Charles Garnier and opened in 1875. 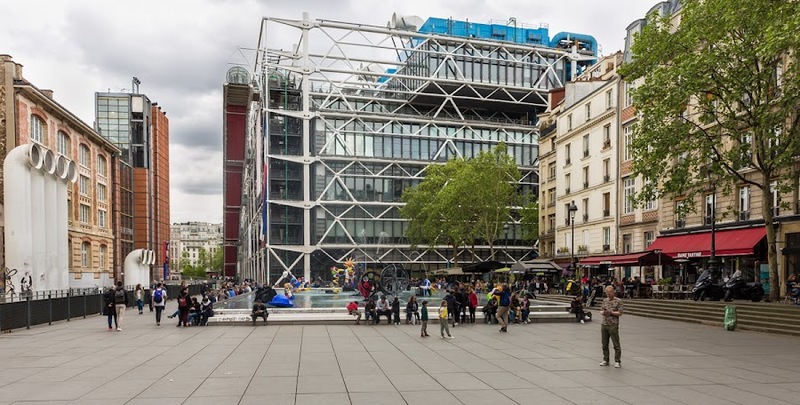 A new modern opera house was built in the 1980s on the Place de la Bastille. Approaching the Place de l'Opéra from the rue du Quatre Septembre. Unless you have a lot of time and are very patient, it's hard to get a good clear shot of the Opéra building from the place. Traffic moves through from all directions, including tall trucks and tour buses. On this day, there was a construction vehicle parked in the middle. I have to keep reminding myself that Paris is real city, not some Disney-esque attraction with built-in photo spots. Reality is a much better place, so I happily (most of the time) accept the cars, trucks, and buses as part of the landscape. The main entrance to the Opéra. One day I'd like to go inside. I walked through the place just after ten o'clock and started thinking about lunch. I was on my own, not scheduled to meet up with my friends until after two. Hmmm... where to go? Oh, don't ask why. There seems to be a proliferation of pizza places in Paris. I don't remember seeing so many, everywhere. Maybe I just wasn't looking, but I don't think that's the case. 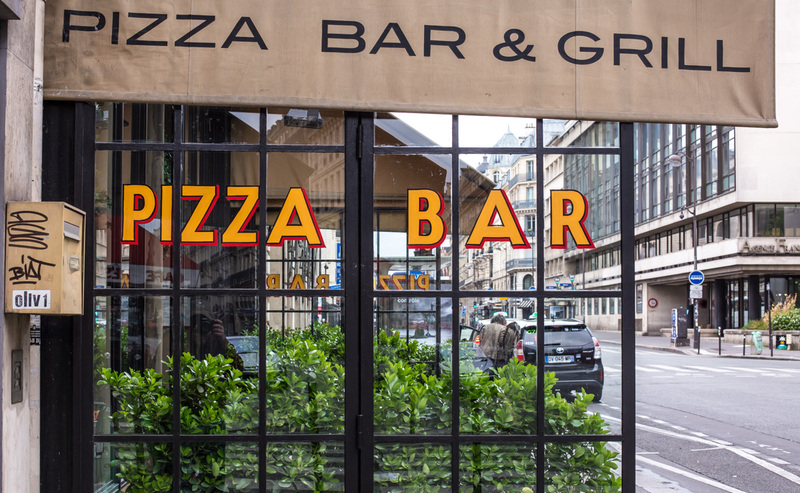 This pizza bar is on the rue du Quatre Septembre. It wasn't lunch time yet and I didn't eat here. 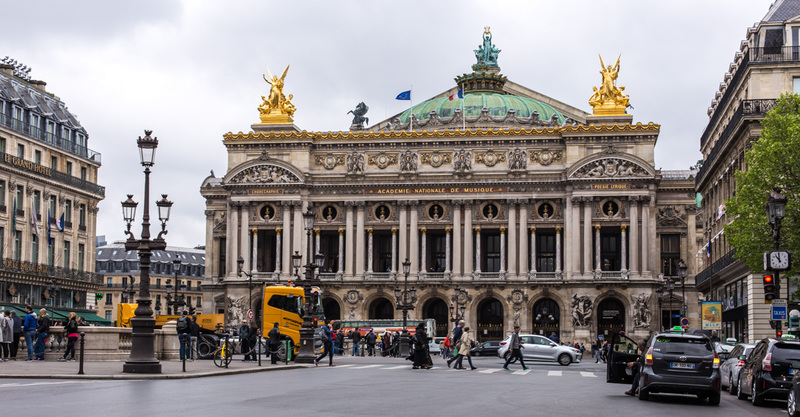 I continued my Sunday morning walk westerly, toward the Opéra, humming a Doors tune. Here's a restaurant that Ken and I have actually eaten in. It was back in the '90s after going to see Véronique Sanson give a concert at the Olympia. We were looking for a place to eat that was open late, after-hours. We found this place on the rue Vivienne across from the Bourse (the Paris stock exchange) and it was bustling. In fact, the restaurant was packed to the rafters. Le Vaudeville in the morning. It opens at 8:00am, seven days a week. It's a big place, but the only tables available, two of them, were in the "non-smoking" section. Ha! Those two tables were completely surrounded by the rest of the restaurant. One didn't need to "light up" to smoke at those tables. Smoke hung thick in the entire dining room. That didn't bother us much, as we had a habit of enjoying cigarettes while on vacation in France (not any more). Since then the law has changed to prohibit smoking inside restaurants. That's a good thing. 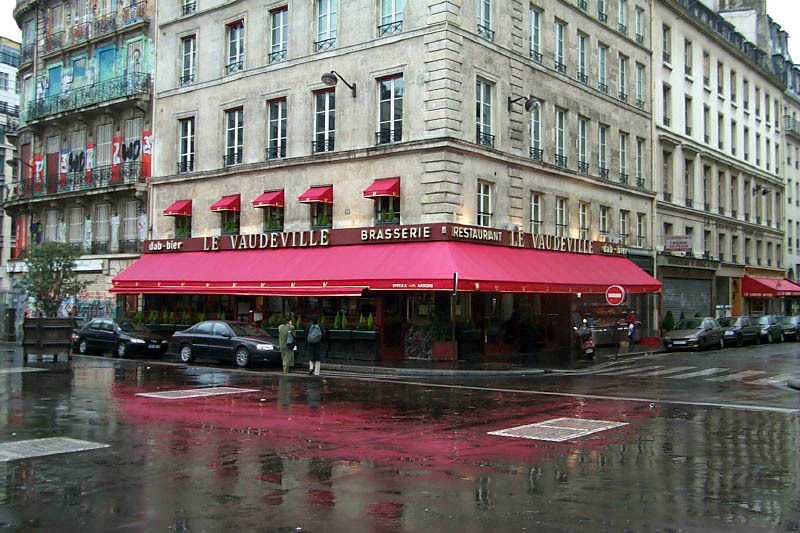 Here's a photo that Ken took showing Le Vaudeville as it looked when we ate there in the late '90s. The restaurant is a full-service brasserie that specializes in fruits de mer (shellfish) and other seafood, but I don't remember what we ate. I do remember that it was good and we had a great experience. Still in the same neighborhood, on the rue Vivienne. This is an Italian restaurant called Daroco. It fronts the street, but also has windows into the Galerie Vivienne. 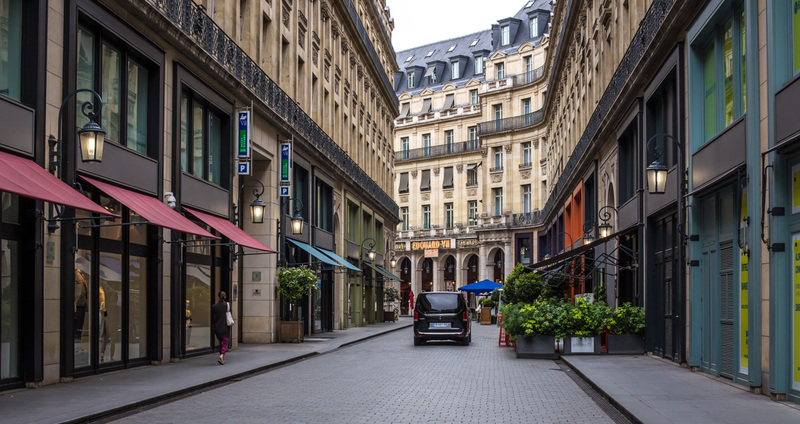 Passages and galeries in Paris are the 19th century precursors to shopping malls. They're glass-covered passageways, often between buildings, lined with shops. Their translucent roofs bring light into the galerie while protecting shoppers from the weather. Part of Daroco's dining room seen through the windows inside the Galerie Vivienne. I passed by in the morning before the restaurant opened for lunch. 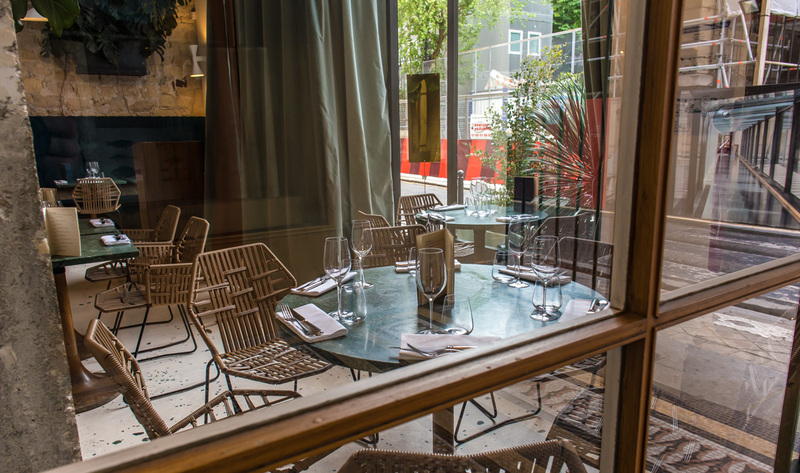 I could see the staff inside busily preparing for the day and getting the wood-fired oven ready for pizza making. Yum. But I would not eat here this day. Running north from the Palais Royal is the rue Vivienne. Along its western side is the Bibliothèque Nationale de France (the French National Library). The old one. The new site over on the eastern end of the city is often called the TGB, or Très Grande Bibliothèque (the Very Big Library), a play on words with the TGV, France's high-speed rail train. Looking up the rue Vivienne from the Palais Royal. Opposite from the old library, which is undergoing renovations right now, is this restaurant, Le Grand Colbert. It's named for the finance minister who served under King Louis XIV. I walked up the street and liked the contrast between the building's art-deco façade and the scaffolding on the old library. 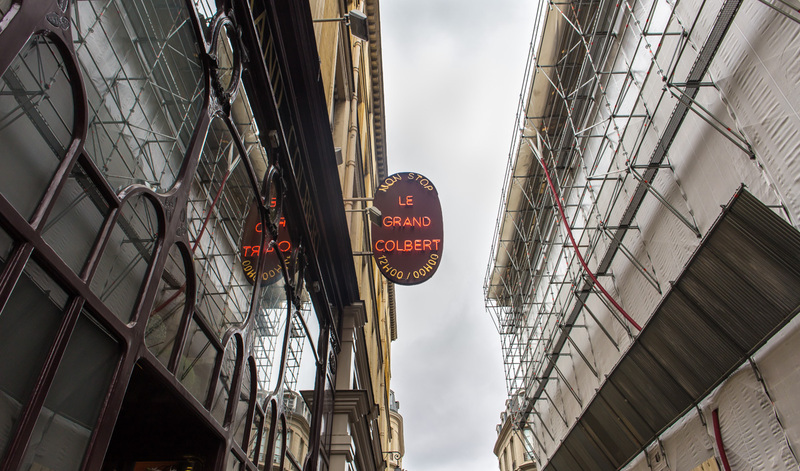 Le Grand Colbert, open "non-stop" from noon until midnight. I don't know anything about this restaurant, other than it's famous. I don't know whether it's good, or expensive, or not. Oh well. Something to research, maybe, one day. Let me know if you've been there! Here's a restaurant that I'll probably never dine in (too rich for my blood). 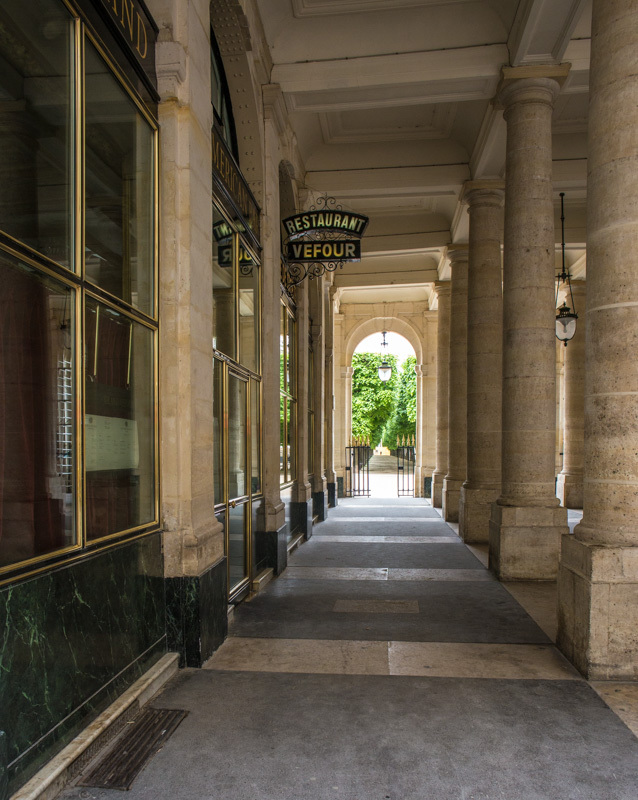 It's called Le Grand Véfour, located on the northern end of the Palais Royal. It was established in 1784 by a man named Jean Véfour. In 1953, the restaurant was awarded three Michelin stars under chef Raymond Olivier. After thirty years with three stars, the Véfour was reduced to two stars, but in 2000 chef Guy Martin got the third star back. Le Grand Véfour, with the garden of the Palais Royal in the background. The third star was taken away again in 2008. Guy Martin, now quite a celebrity, bought the restaurant in 2011 and remains the Véfour's chef. He hosted a television series on food called Epicerie Fine that ran for 35 episodes, most of which we've seen over the years. 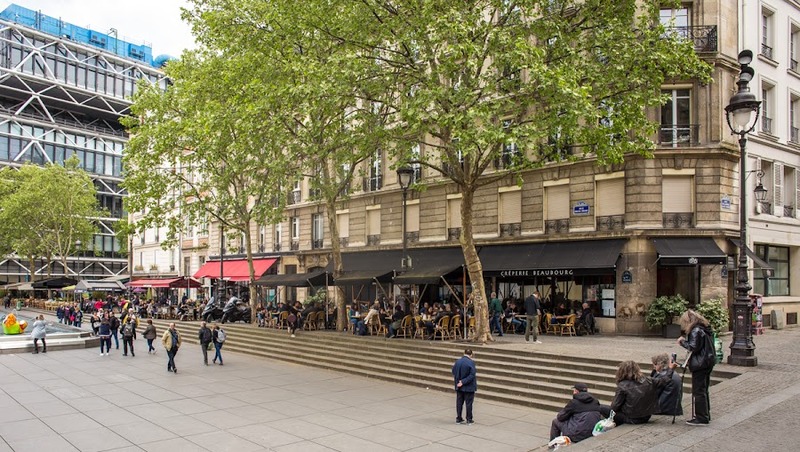 After leaving Saint-Sulpice, I made my way over to Odéon and the boulevard Saint-Germain. I new a café there that I liked and, sure enough, it was bustling. I sat in the window and had a café and croissant. After that, I headed along the boulevard to a branch of my bank to get some cash from the ATM. 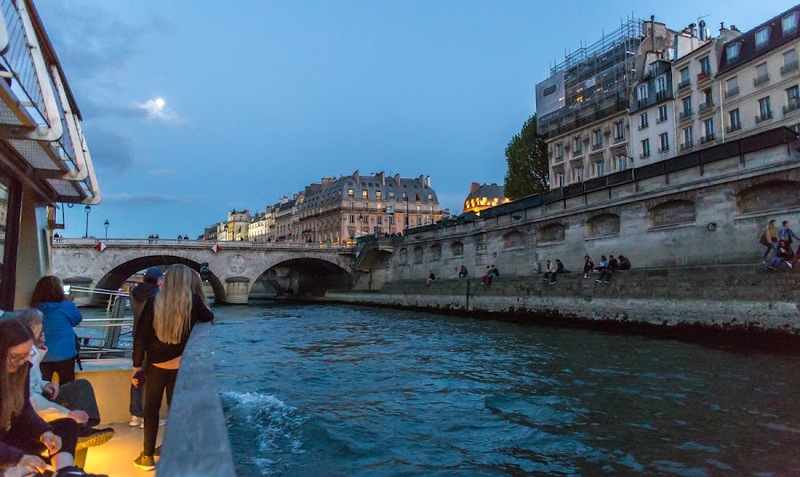 I walked back along the river to Notre Dame, then across Cité through the Place Dauphine, where I saw another bride and groom, dressed in their wedding clothes, getting their picture taken. The theater is on the northwest corner of the Palais Royal. I continued walking around the Louvre on the rue de Rivoli to where the Comédie Française backs up against the Palais Royal. I went through the garden enclosed by the Palais (and saw several more wedding parties being photographed. It's a thing!) and exited on the north side. I didn't take any pictures during that entire walk, until I found the Théatre du Palais Royal. I don't know why. 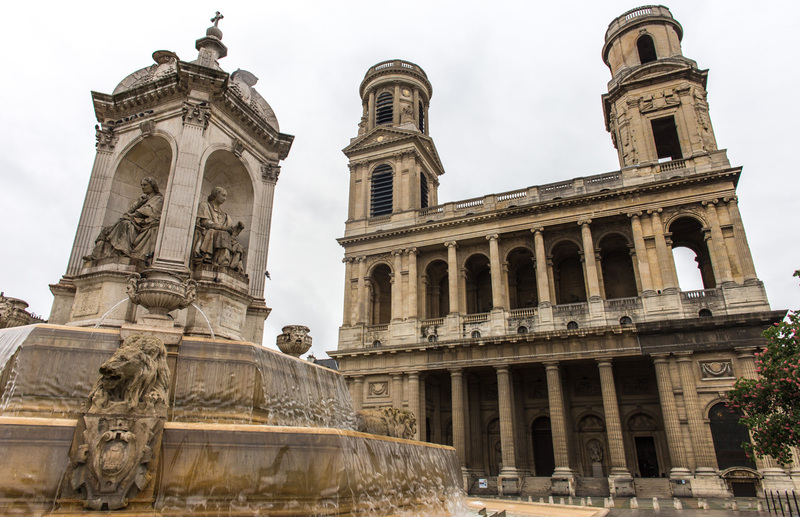 Here are two more views of the Saint-Sulpice church and its fountain. The first is a wide-angle close-in shot that seriously distorts the perspective. But so what? The fountain has amazing lions. The second is just one of those shots I take in passing without really thinking about it. I'm not sure what I was going for, maybe the water in the fountain, but I like two buildings in the background framed by the fountain and the church. There's no obvious subject, just another throw-away image, but I don't throw any images away (I don't post every photo I take, either). We all take photos we don't like, but that doesn't mean they're bad. There's usually something about them that someone will like. And these days, with digital photography, taking too many photos doesn't cost any more than taking too few. And a lot of adjustments can be made with software to salvage images with minor problems. 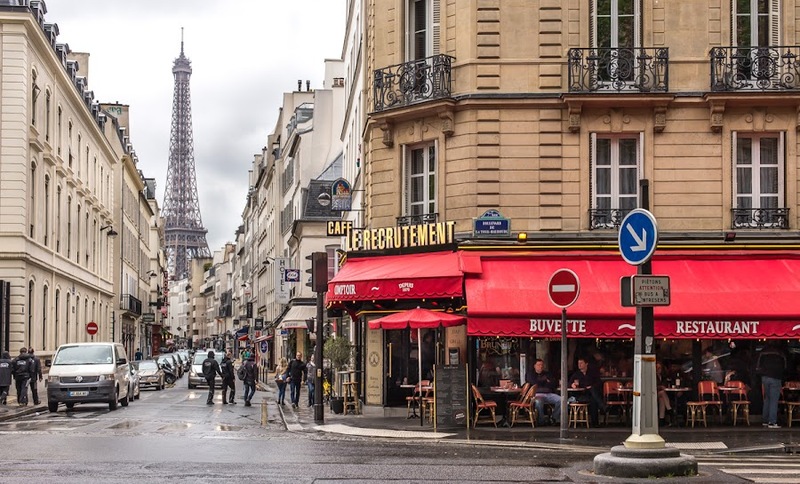 I woke up on Sunday morning with the idea that I would go back to the place where I lived and went to school in 1981 for a morning coffee and a croissant. The ladies were occupied until after lunch, so I was on my own. 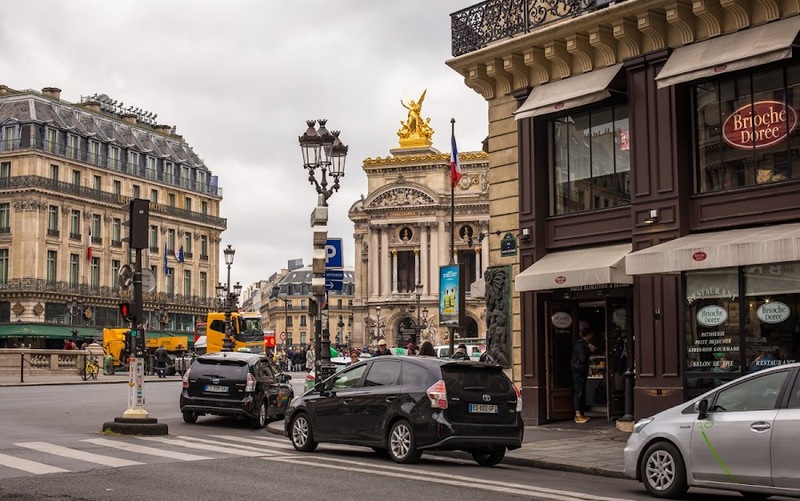 I headed over to the Left Bank and the intersection of the rue de Rennes and boulevard Raspail. The school (Alliance Française) is on Raspail just a couple of streets away. 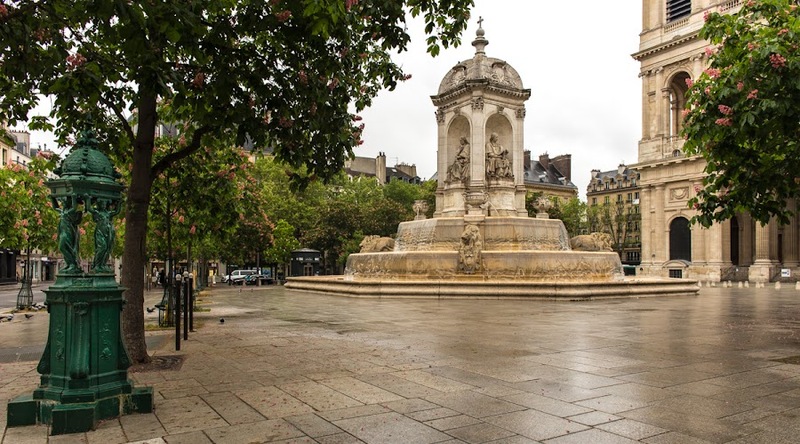 The fountain at the Place Saint-Sulpice and the church towers rising up behind. I got off the métro at Rennes and walked up to St.-Placide. The neighborhood was stone silent with hardly anybody in the cafés. Not was I was looking for. 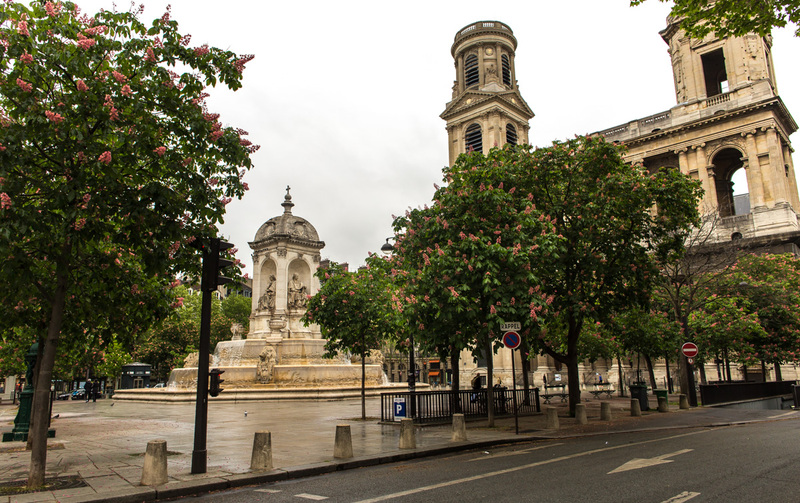 So I wandered down the rue de Vaugirard and made my way to the square at Saint-Sulpice, just a couple of blocks from the place I lived in 1981. I used to walk through this square and by its impressive fountain on my way to school every day. Two fountains. The big one, of course, and the green "fontaine Wallace" (on the left) which provides a single stream of drinking water in the center. There are 120 of these public water sources around the city. Everything was peaceful on this early Sunday morning, and it had rained earlier, so the pavements were all glistening. I walked around the square and took a few photos. And here's the "money shot," probably what most people want to see on these boat tours. 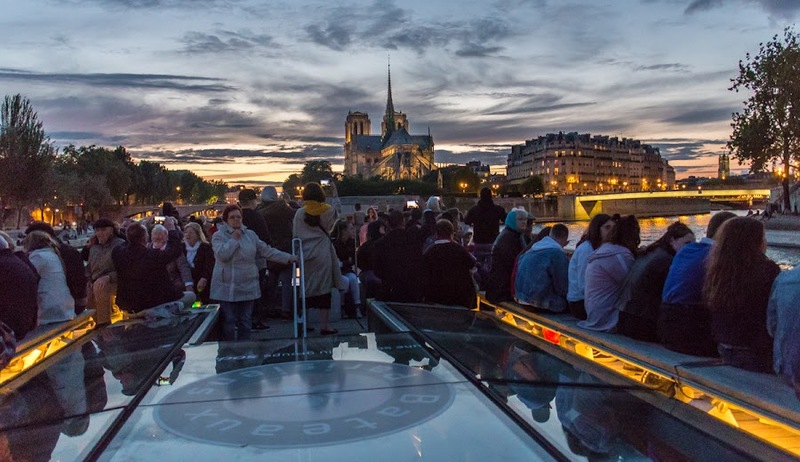 It's the back side of the cathedral of Notre Dame, lit up just after sunset. 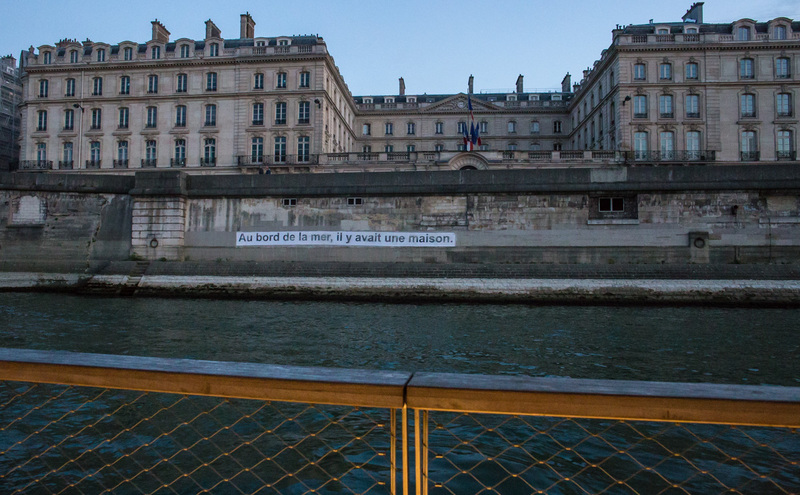 At this point, our boat turned around and headed back toward the Eiffel Tower. I went up to the boat's upper deck for this shot of Notre Dame. And here's a bonus shot! The statue is of Sainte Geneviève, the patron saint of the city of Paris. The big glassed-in room at the top of the building to the statue's left is the famous Tour d'Argent restaurant. 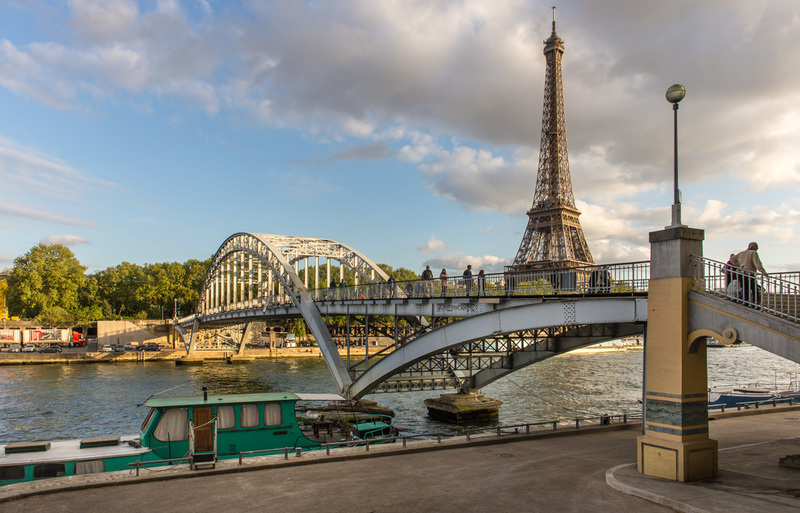 The statue of Sainte Geneviève is built on the Pont de la Tournelle between the Left Bank and the Ile Saint-Louis. After the cruise, we headed back to the ladies' hotel. L and P were hungry, so they and I went to a brasserie just across the street for a late night snack. L had an omelet, P had a bowl of onion soup, and I had a croque monsieur (a grilled ham and cheese sandwich). I got back to my hotel sometime after midnight. So ended the Saturday portion of the weekend. Next up: Sunday! As we got closer to the islands and the center of the city, we were losing good light for photography, but the sights were stunning with all the nighttime illuminations coming on, and we were two days away from a full moon. I spent a little time on the narrow deck outside the window next to our seats. 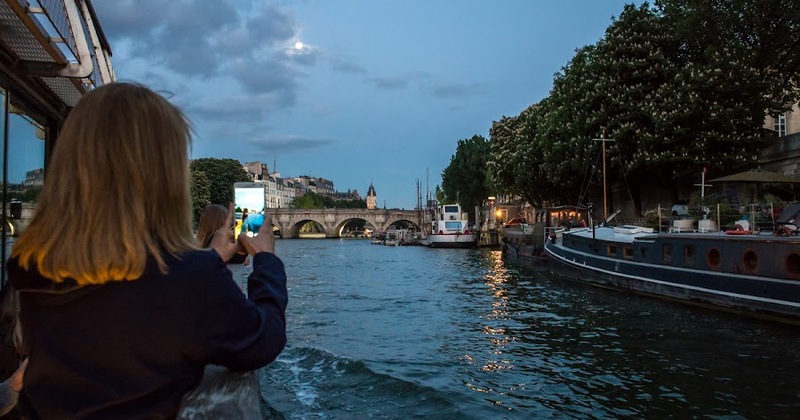 I believe that this is my friend L taking a photo of the Pont Neuf and the almost-full moon with her smartphone. Approaching the Pont Saint-Michel which connects to the Left Bank (still on the right!) Place and Boulevard of the same name. 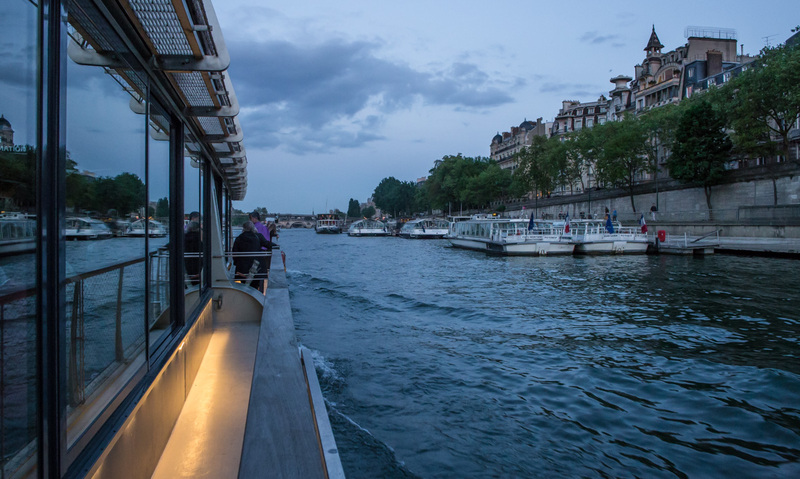 Navigating a narrow channel between the Ile de la Cité and the Left Bank at the Petit Pont. The boat made its way upstream and we enjoyed the ride. Here and there we saw photo opportunities. We sat next to a window facing the Left Bank, and noticed that the window slid open and we could go out onto the deck to take pictures. I think this is the Pont de la Concorde. You can see the big Ferris Wheel on the right bank. Going upstream, the Right Bank is on the left and the Left Bank is on the right. Got it? All during the cruise we could hear the live narration of what we were supposed to be seeing. In at least five languages. I could get the French and the English (of course), but there was also Italian and Spanish, I think, and one or two more. They narrator was talented, to say the least. This is la Caisse des Dépôts and Consignations. Some governmental finance thing. The painting on the wall says, "On the seashore, there was a house." I guess it's art. And along the way we saw people on the banks of the river having fun. These women were obviously having a real good time. I'm sorry that my photo didn't turn out great, but it gives you the idea. They were signing, or chanting, or something. My friend L's group had booked space on a tour boat for Saturday evening. 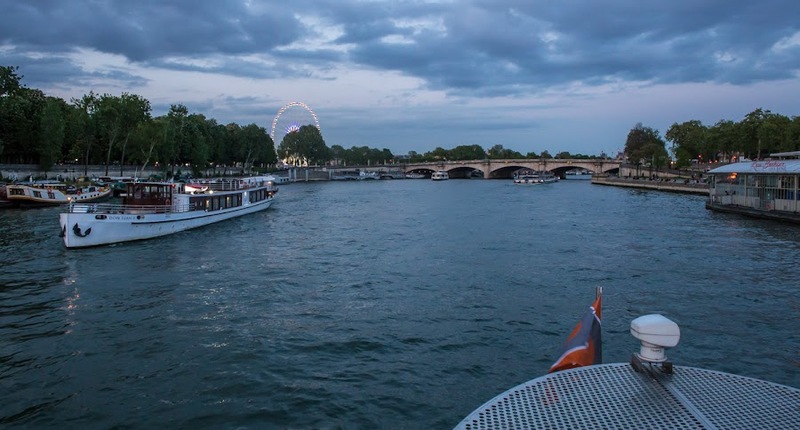 This company's boats leave from the foot of the Eiffel Tower and cruise up river then turn around behind the cathedral of Notre Dame and return. L arranged for me to go along and I met the group at the dock at 20h45. The sun was going down as I approached the Eiffel Tower on foot. The boat we were on had two levels, inside on the lower deck and outside on the upper deck. The boat was full, probably with other groups and individuals as well. We spent the cruise watching and talking and occasionally going outside for photos. By the time we returned to the dock, night had fallen and it was too dark for snapshots. The Pont Alexandre III connects Invalides and the Grand Palais. I managed to get a few photos during the first half of the cruise. The combination of the darkness and the motion of the boat made it a little challenging, but I'll post them anyway. I hadn't been on a river tour since 2000, and I had a great time! Chugging up river. It's getting darker! Some of the tour boats that ply the river have big spotlights on them that light up the riverbank as you cruise by, but the one we were on didn't. I've done both, and I kind of liked that our boat didn't have the lights. I have a few more images to post the next time. Or two. 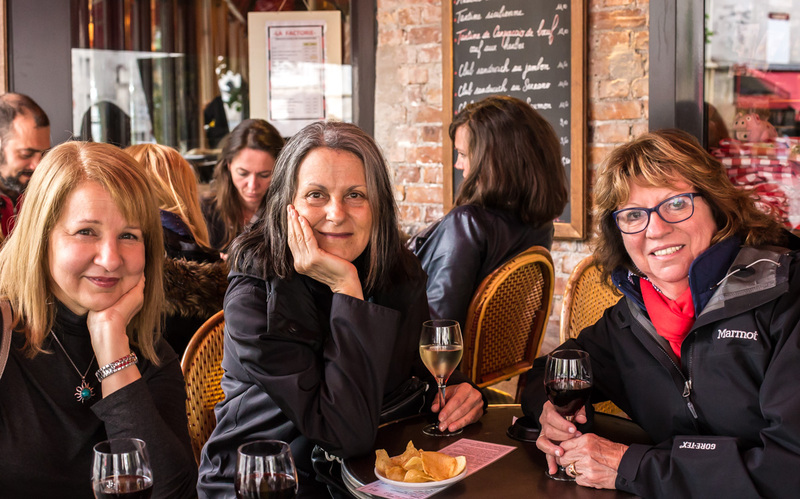 After the Tuileries, L, P, J, and I headed over to a wine bar I knew of called Ô Château. The guy who runs it, a sommelier named Olivier Magny, had a television series a few years ago in which he visited a different French wine region in each episode. So I was curious. 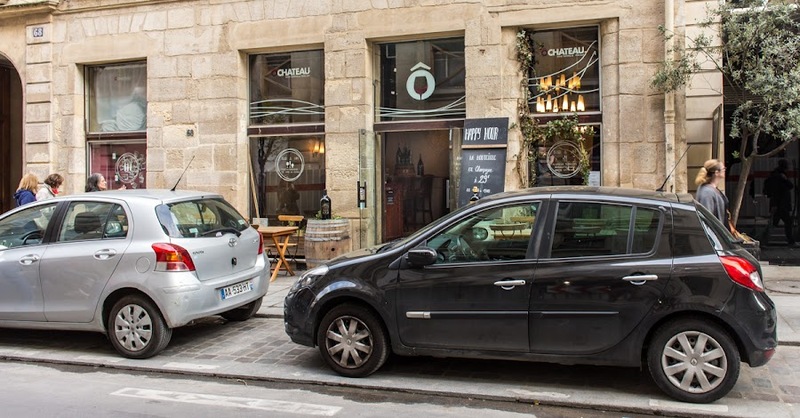 Outside the Ô Château wine bar. My friends L, P, and J are there on the left. When we got there, there was Monsieur Magny sitting outside working on something. When we got inside and ordered, he stopped by our table to ask if we were there for the wine tasting that was starting downstairs. We weren't, but I asked if he was indeed Olivier Magny and he said yes, and he asked how I knew him. I told him I had seen his television show. Big smile. Yours truly and L, taken by our friend P. A little blurry, but after a couple of glasses, who isn't! It was nice to see him and maybe one day Ken and I will sign up for one of his tastings. 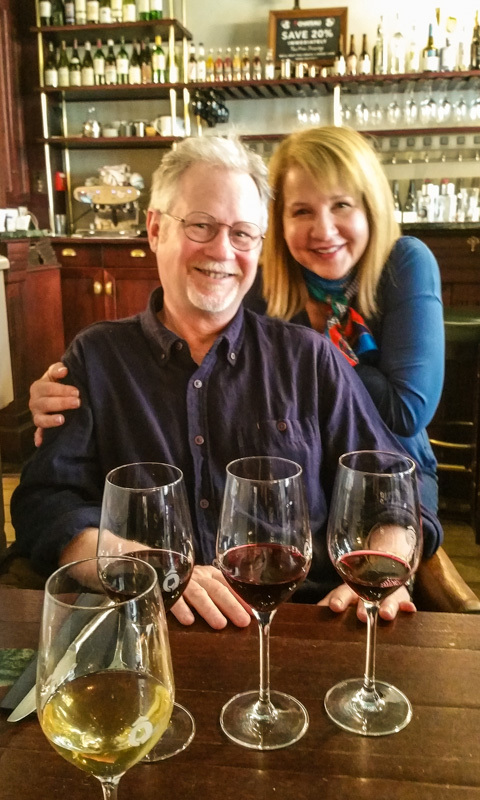 We enjoyed our wines and ate a small plate of cured ham and veggies before heading back to our respective hotels. 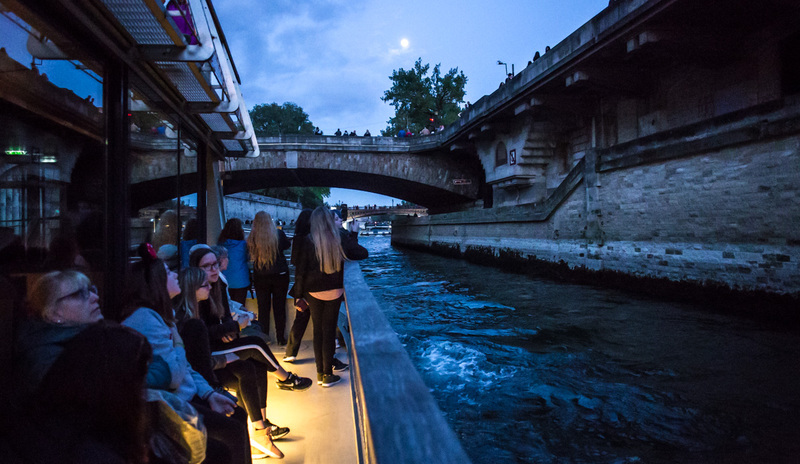 The ladies had a bus tour in the early evening, after which we were meeting up for a sunset boat tour on the Seine. 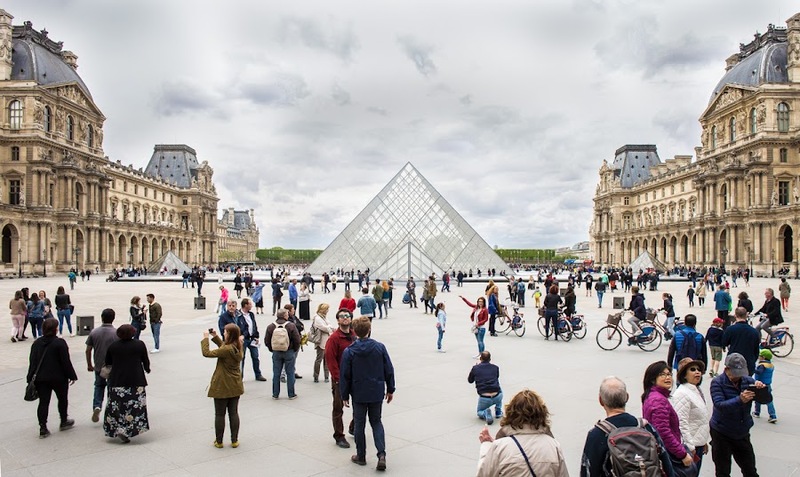 The main entrance to the Louvre museum is through the big glass pyramid. All four pyramids are skylights over the vast ticket hall below ground. There was quite a line to get in on this day. It was Saturday, after all. Thankfully, we weren't going inside and just continued on into the Tuileries Garden beyond. Looking west toward the Champs-Elysées, with the Cour Carrée at my back. The green trees in the distance are in the Tuileries Garden. Before the pyramid was built, the courtyard was a parking lot for the people who worked at the Ministry of Finance offices inside the Richelieu Wing (on the right in the photo). Museum-goers had to negotiate the parking lot and find their entrance through a door on the south side of the courtyard in the Denon Wing (on the left in the photo). Since then, the Ministry was moved out to more modern quarters and the museum space expanded. Looking back at the Louvre from a café in the Tuileries Garden. As my friends finished up their lunch, I enjoyed a glass of wine at a nearby café and watched the people go by. 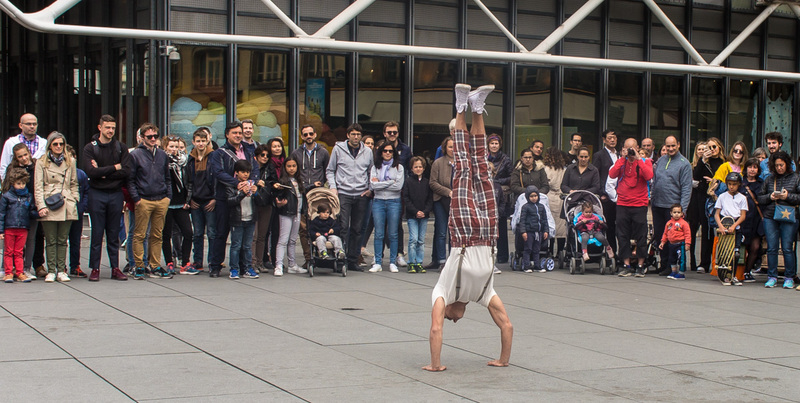 It's one of the best things to do, people-watching in Paris. I noticed a young guy walking by wearing red and blue plaid pants (that looked like pajama bottoms) held up with suspenders over a white tee shirt. Odd, I thought, as he walked back and forth a couple of times. My friends ate lunch at this crêperie while I had a drink at the café at the far end of the row. It turns out that he's not a weird dresser, but a street artist and he was preparing for his show. After my friends and I met up and figured out where to go, we noticed a crowd gathering behind us. 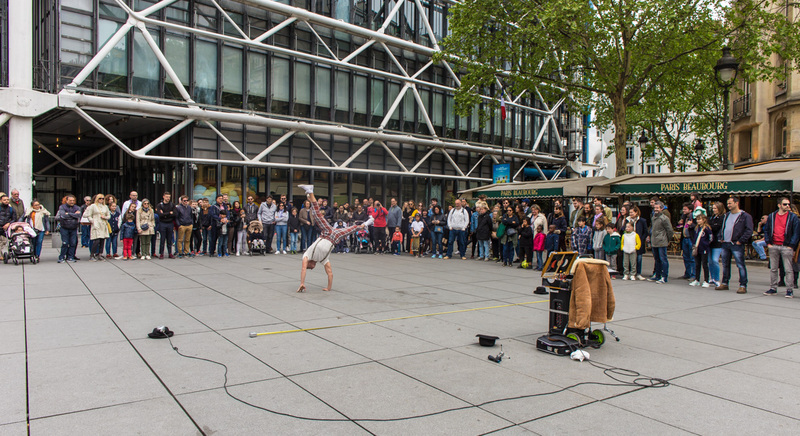 Then there was some music and the guy with the funny pants doing acrobatics. The guy in the funny pants gets his act going. We watched for a few minutes and then got on our way. Our destination was the Tuileries garden on the other side of the Louvre, a good half-hour walk (or more) from where we were. We were six adults with two kids in tow, and the kids wanted some ice cream. Off we went! Doing push-ups this way must be difficult! 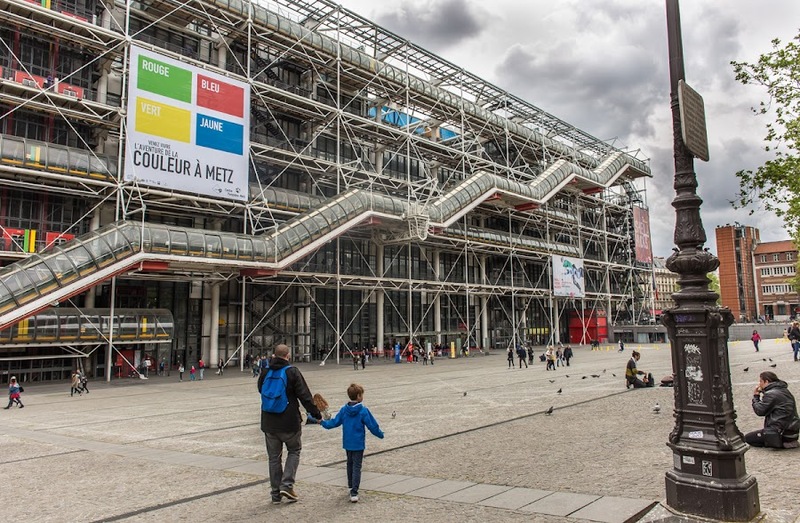 I didn't go inside on this visit, but I did hang out next to the Pompidou Center (Paris' contemporary art museum) for a little while waiting to meet my friends. Lunch time was winding down and people started filling up the streets again. The museum's main entrance is at the bottom of this plaza. The zig-zagging tube contains the escalators that move people up and down between levels. The south end of the museum and the Stravinsky Fountain. I walked around a little to see if my friends were out from their lunch early. We had made plans to meet near the "lips" in the Igor Stravinsky Fountain. 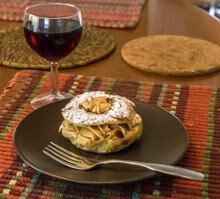 They were still finishing up, so I sat down at a café and had a glass of wine. This is where I had a drink while waiting for my friends. 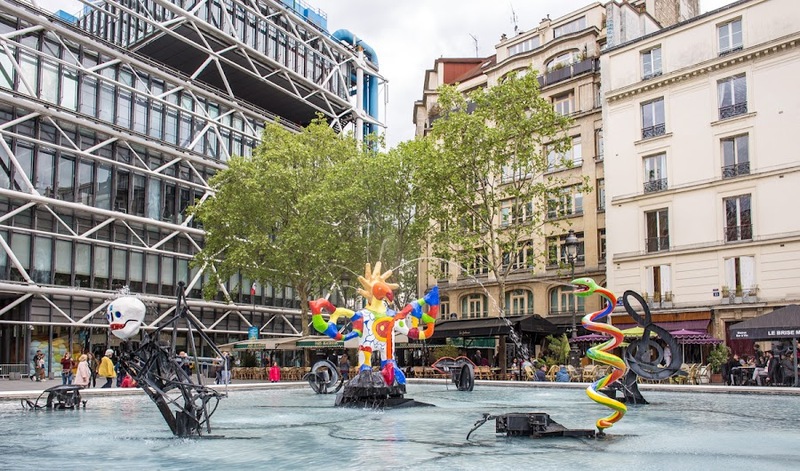 The Stravinsky Fountain, built in 1983, is modern and whimsical. If you look closely, you can see the back side of the "lips" in the lower center of the image.